"I've got an hour before we need to depart - what should I whip up?" I ask the hubs as I simultaneously flip through every cupboard and then the fridge, once, then three times. "I don't know babe - I've never really known you to 'whip' anything up..." he grins, earning himself a smack on the shoulder. Then I recall my dear friend Karen's deliciousness she brought to the office last week and scrambled to dig through my email to unearth the recipe she passed along. 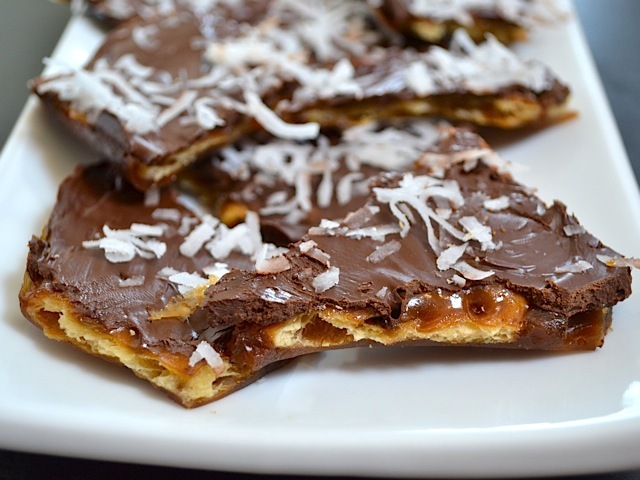 Saltine Toffee Candy. Prep time: 15 mins. Cook time: 8 mins. Cool time: 60 mins. Perfect. At the family BBQ, they went off like a hit, consumed by all and delighted with "yum yum" sounds and faces. I found them quite delicious myself, though not as fabu as when Karen made them (this is a given). 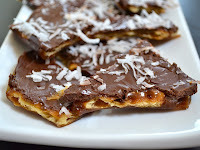 My only recommendation would be to make sure to spread the toffee just right so that it soaks through on the top, not so much the bottom, as the toffee taste can be a bit overwhelming and sticky when you overdo it. I'm not sure what I did, but Karen had balanced it just right. We also ended up skipping the coconut given preferences in our family. Regardless, they were tasty, super easy, inexpensive and different.